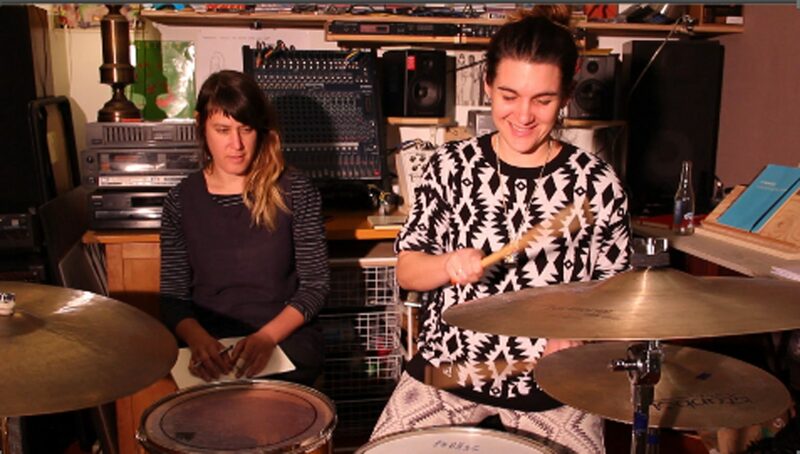 Lisa Schonberg (left) teaching Alicia Jo Rabins (right) to play drums as part of their chavruta. Still from the film Chavruta: A Drummer’s Bat Mitzvah. Courtesy of the artists. ALICIA JO RABINS and Lisa Schonberg are longtime friends and prolific artists; Rabins is a musician and writer who is also a Jewish educator, and Schonberg’s many hats include percussionist, composer, and environmental artist. After years of joking, and then not joking, they agreed to do a very particular skillshare: Schonberg would teach Rabins to drum, and Rabins would prepare Schonberg to finally become bat mitzvah at age 40, and to read from the Torah for the first time. As the two explored the other’s passion, they discovered surprising connections between drumming, spirituality, and the history and changing roles of women as religious leaders, and decided to document the process. The result is Chavruta: A Drummer’s Bat Mitzvah, a short film directed by Jodi Darby. It documents preparations for Schonberg’s bat mitzvah and the friendship between the two women. Rabins and Schonberg spoke with Jewish Currents in anticipation of the film’s New York City premiere at Town and Village Synagogue, Saturday, February 23rd at 7pm. This interview has been edited for length and clarity. Gabriela Geselowitz: How did you two originally become friends? Lisa Schonberg: We met through Alicia’s husband Aaron. Aaron and I met in the Olympia music scene—his old band Old Time Relijun played shows with my old bands The Strangers and Thunder!Thunder!Thunder!. After we all moved to Portland, Alicia, Aaron and I played together in one of my short-lived bands, Clea Partridge. GG: Lisa, you discuss Jewish religious tradition as seeming mysterious to you growing up. What inspired you to finally broach it and make it more familiar? LS: My curiosity about Jewish religious tradition has grown stronger the longer I’ve lived in the Pacific Northwest. The absence of Jewish culture in my daily life in Portland grew more and more apparent every time I visited my hometown of New York City, so I was longing for a way to reconnect to just anything Jewish. I wanted to cultivate friendships with more Jews, and talk about being Jewish—you know, stuff that just happens naturally when I’m in New York City. I was getting tired of having to explain to people the difference between Passover and Hanukkah. I was really hungry for connection with my Jewish identity. My Jewish identity is based in our family’s history in New York City and our Eastern European roots, but around the time that Alicia and I decided to have a work trade, I had recently returned from my first trip to Israel to celebrate my sister’s wedding. I’d become more curious about Hebrew language, and the Jewish religious texts, and the ancient stories about the places we visited, and what they had to do with me and my ancestry. I also felt more of a responsibility toward learning about the reality of conflict in the area. GG: At what point did you decide to share the story of this project in a short film? Alicia Jo Rabins: I think when we got serious about doing the skill-trade (after joking about it for a couple years) we realized that it could provoke interesting discussions about what it means to learn as adults, how to make ancient traditions our own, and the power of teaching each other what we know. The idea to invite our filmmaker friend, Jodi Darby, to document the process was a part of deciding to really do this project! We saw it as a hybrid art project/skillshare/spiritual exploration from the beginning, so it made sense to tell the story of what we were doing, to not have it simply vanish once we were done. GG: This film explores how religious traditions and gender roles have always been in flux, from ancient Near Eastern goddess worship through to the modern invention of the bat mitzvah. In light of this fluidity, do you feel obligated to a sense of some sort of “authenticity” when exploring Judaism? AJR: Everything changes all the time, so I’m not too worried about authenticity. I have a pretty sensitive detector for things that are hokey or pretentious or too based on the ego of a specific leader—I tend to run in the other direction from them. But for me, however weird or out-there a new Jewish practice or idea is, if it has something to do with a tradition—whether that’s ritual or food or language or story or God-concept or politics or any other aspect of culture—it’s authentic enough for me. It may not be interesting to me, but that’s a different question. LS: I feel similarly. I grew up with basically my family’s own version of Judaism—with an emphasis on honoring ritual, tradition, and identity, but in a mostly secular way. Other people we knew—friends, neighbors, my cousins, my grandparents—had different versions [of Jewishness]. Grandma kept kosher, we didn’t, but it was all ok with everyone and didn’t make anyone less Jewish. And all of that felt authentic. And so taking on yet another approach to Jewish ritual and identity and practice in my adult life feels just as authentic to me. GG: You found that drumming is closely tied to ancient female spirituality. AJR: I was surprised to learn that women were the drummers in the ancient Near East. The Torah contains multiple stories of women with “tof u’mchol,” essentially drumming and dancing at a heightened spiritual or political moment: Miriam after the Exodus, for example, and Yiftach’s daughter when her father returned from battle. And in most Jewish museums with ancient artifacts you can find small figurines of women holding round frame drums. There’s a wonderful book called When the Women Were Drummers by Layne Redmond, which has a lot of archeological and artistic evidence of women’s drumming traditions in the ancient world. Lisa and I studied it together and we were inspired to learn that women’s drumming was often tied to spiritual practice as well as the animal kingdom and the cycles of nature—many of the themes we were working with. Alicia Jo Rabins (left) preparing Lisa Schonberg (right) to read from the Torah at her bat mitzvah. Still from the film Chavruta: A Drummer’s Bat Mitzvah. Courtesy of the artists. GG: Given your skillshare, and your research about drumming and spirituality, did percussion play a role in Lisa’s bat mitzvah ceremony? AJR: Yes! It’s not totally clear in the film, but the footage of me and Lisa drumming together outside actually took place in the middle of the ceremony. We had intended to have the ceremony outside, and segue into the drumming, but it was over 100 degrees out and the glare was intense, so we held the ceremony inside and then had everyone walk out to hear the drum piece, then head back in. GG: Lisa, how did you feel at your bat mitzvah? LS: I felt very accomplished, and so happy about having my family and friends there to witness it. Turning 40 was a very big moment emotionally, and I had not only reconnected with my roots in a new way, but I had learned a new skill. And that felt, and still feels, very empowering. I was left with a feeling of lingering curiosity about what else I could learn about Jewish tradition, and what I could learn from the Torah. It made me feel more confident about attending services on the high holidays; I felt like less of an outsider, like I belonged, and I understood so much more about the things that were said and read and sung. Since my bat mitzvah, I’ve been researching how Jewish texts relate to environmental issues; it’s been wonderful to discover how the texts address things at the core of my career and my passions. GG: What would you like viewers to take away from this film? AJR: I want people to appreciate the wisdom inside them and the power of their own questions. To appreciate that Judaism, like all cultures, is always evolving, and each of us can play a part in what that means. I also want to highlight how learning happens throughout our entire lives, not just when we are young—that there are so many adventures and deep journeys that we can undertake with more perspective as we grow older. Gabriela Geselowitz is a New York-based writer and the former editor of Jewcy Magazine. Alicia Jo Rabins is the author of poetry books Divinity School (2015 APR/Honickman First Book Prize) and Fruit Geode (finalist for the 2018 Jewish Book Award). She has released three albums with Girls in Trouble, her indie-folk song cycle about Biblical women; her one-woman chamber-rock opera, A Kaddish for Bernie Madoff, is currently being made into an independent feature film. Lisa Schonberg is a composer, percussionist, field recordist, writer, naturalist, environmental artist, and teacher. She integrates her interests through creative documentation of soundscapes, insects, and habitat, with the goal of drawing attention to endangered species, habitat loss, and other environmental issues.